Where are you going to start with this one then? 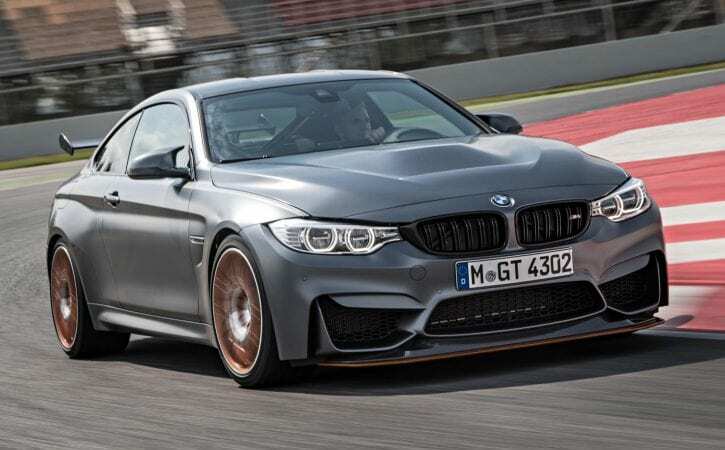 I’m going to get the sticky stuff out of the way first – namely that fact that this is a BMW M4 that costs £120,770. Over double the price of a standard one. It doesn’t fully justify this on the strength of how good it is to drive. Instead it’ll sell on the strength of its exclusivity. Only 700 are available worldwide, and just 30 of those are coming to the UK. Own one and your owner’s club meetings will be very exclusive. OK, more tricky stuff to get out the way. The orange is a hark back to the last generation M3 GTS which was launched in a pretty startling shade of orange. It didn’t have orange wheels though. Hmm. Combine it with the carbon wing, reprofiled bonnet, lowered suspension etc and it does look rather like it has crashed through a tuning shop. But it has. It just happens to be BMW’s own one. That’s true, and they’ve had a good tinker with it. Take the bonnet for instance – it’s actually much more interesting on the underside where you can see the fat weave carbon construction that has saved 3kg. If you poke a bit deeper you find three-way adjustable suspension, a roll cage (orange, obvs), an overly fat-rimmed steering wheel, a weight optimised centre console (they’ve basically done away with the storage bin), lightweight door cards that seem to have been made of some nifty carbon fibre/wool combo and contain no speakers, so tunes are broadcast only to the rear cabin, fabric door pulls (which means no handles to grab to prevent the door whacking open into the car next door). And of course, more power. 68bhp, taking the total to 493bhp. You might have heard that it makes this thanks to a water injection system that cools and condenses the charge air and allows the turbo to run higher boost pressures. It’s in the boot, under the floor. It does need to be topped up with distilled water about once every 3-4 tankfuls, so about every thousand miles or so, although if you’ve been on track, more often. Anyway, 493bhp and 442lb ft (up 37lb ft), which is considerable. At the other end of the power to weight graph, the GTS is 30kg lighter than a regular M4, at 1510kg. Not a vast drop, really. But enough (in combination with a sticky set of Michelin Pilot Sport Cup 2s) to drop the 0-62mph time by 0.3secs to 3.8secs. With no speed limiter fitted, top speed stands at 190mph. It is, but so’s the standard M4 and you don’t feel that much of a performance benefit as, broadly speaking, the power delivery hasn’t changed that much – it’s still a twin turbocharged 3.0-litre straight six with a surging mid-range, just with a bit more potency at the top end. What you do notice much more is the noise. It has a full Akrapovic titanium exhaust. Much of the sound deadening has been done away with. You can see how this ends. It’s good, really raspy and hard. There are hard, fast crackles when you lift off suddenly, it’s fizzy and loud and cool, although after a while you do become aware that all the noise is coming from the back end, not the front. Precious little induction howl, which is what made the last GTS, and before that, the E46 CSL with it’s carbon airbox, so special. Go on, how much faster is it around The German Circuit? Almost 30 seconds. That’s a massive gulf – although the lion’s share of that will be down to those Cup 2 tyres. OK, but does it feel different to drive? Yes it does, and this is where my cynicism gives way to enthusiasm. Initially, after the first few miles, I wasn’t entirely persuaded. It felt stiffer, but a bit jittery, road roar was intrusive, the fat-rimmed steering wheel irked me. It felt a bit thuggish. It grew on me. Considerably. The damping has that same precision that a Porsche GT3’s does – it feels sharp at low speed, but as you go faster the suspension’s quick reactions mean it’s not caught out. It’s firm, but really satisfying to punt down a good road. Very positive steering and turn-in, unbelievable front end grip. This is not a car that understands understeer. And how. You may be aware that the standard M3/M4 has a reputation in this area – the electronically controlled differential is, let’s say… keen to assist with your oversteer needs. Some people find it a bit hectic. It deliberately pushes power through the outer, loaded wheel to make the car feel dynamic (seriously, if you’re buying a regular M3 or M4, have it with the Competition Pack, it’s miles better and actually very good value). This one, on a dry track, with this rubber, is better still. It’s crisp and powerful and punchy. And fun to drive – the combination of the rasping, zingy soundtrack, the lovely steering weight and front end grip, the superb one-piece seats, the sheer force of the engine and the wonderful-to-use standard carbon-ceramic brakes are compelling. It’s keen to change direction, gets keyed into the tarmac and feels special, like it’s worth the money. It’s quick on a circuit, would fit right in at any track day. People would love it, and you’d love driving it. Bloody liability. No rear end traction whatsoever. The tyres don’t help, but the big-torque, rapid delivery engine and low-grip-commitment rear axle are a spiteful pairing. You need to be properly on your game if you’re to disable the stability control, which you sort of need to, because even if placed in M Dynamic mode, it’s a bit too keen to get involved, and it does so rather abruptly. I don’t think I’ve ever driven a car with a bigger discrepancy between dry and wet weather behavior. Bottom line: it’s nearly the same money as a Porsche GT3 RS. Which would you have? The Porsche every single time, but you’re talking the wrong rival. If Merc does a Black Series C63 Coupe, or even GT Coupe, that’s where this sits. It’s a burlier car than the Porsche. That’s a surgical instrument, a car for picking apart apexes (apices? ), this is more of the just-wanna-have-a-good-time type machine. It’s a special car in its own right, the M4 GTS, less wearing and extreme than an RS, (maybe more aligned with a standard GT3…). You could drive it every day, but you’d look a bit of a berk with all the orange and, small point though it may sound, I think you’d find the lack of front speakers irritating. It has other creature comforts: AC, sat nav etc, so at this price, why not engineer a sound solution? Basically though, the more I drove it, the more I liked it. I liked the positive way it went down the road, the front end grip and – yes – positivity. It comes across as special, exciting and fun. Different. Maybe even different enough to justify the price.